I’ve always struggled with drawing images. In school, I had a teacher hunt me down to turn in my sketchbook at terms end (he was the sculpture teacher and I think he really wanted to see how my brain worked). Sketchbooks become very personal and frankly, I just didn’t want him to have it! So my drawing skills have not progressed as they should due to my own mental hurdles. But somehow charcoal has been different. It’s a tactile process that allows fingers to be up-close with the image. To me it wasn’t drawing but sculpture. I added & subtracted clay in sculptures, why not burnt wood lays? Maybe I should spend more time revisiting this old love. The desire to work burnt wood over paper was too strong today and I gave in. It’s been pushing forward for weeks plus the dog nose image has been floating around my brain for months and maybe years. My goal is to pull together an image that I’m satisfied with and use it for a polyester lithography print for the “Leftovers” print exchange. Maybe it will be an etching or a drypoint… still trying to decide. 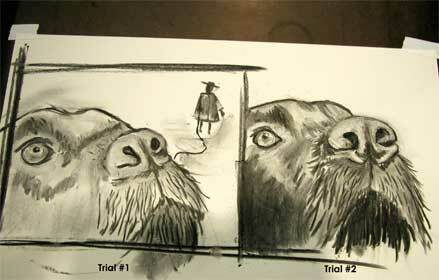 The above image shows Trial#1 & #2. This is strictly sketch mode, nothing set in stone! Trial #2 (right dog) has better proportions & foreshortening. More sketching in charcoal to come! ← Quality photos are worth it! Interesting distinction between drawing and charcoal.